Update: I finish the day +2.12 to level stakes, a couple of strange results but all in all a great days racing and a profit shown. 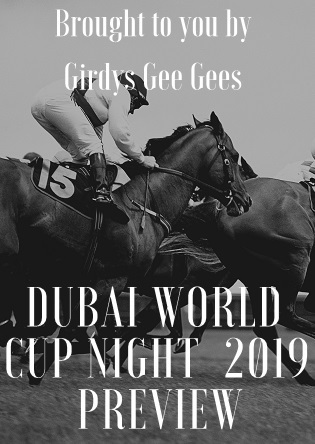 It's World Cup night in Dubai Saturday 30th March 2019 with eight top-class races at Meydan, five being Group 1’s. I have had a punt in all eight, details of which follow. That’s a Goliath bet out in the desert Saturday if that’s your thing. They get underway at 12.15 our time with the Group Two Godolphin Mile on the Dirt track. Muntazah was 2nd to Heavy Metal in this last year and has been aimed at this again this season. He has been warming up nicely winning two C&D G3s, the last in a track record time. Draw bang in the middle of the field not a concern and he looks a solid punt at 5-4. At 12.50 it’s the Group Two two-mile Dubai Gold Cup on the Turf. Godolphin trainer Charlie Appleby looks to hold all the aces here. G.1 Melbourne Cup winner Cross Counter should have too much for this field and he actually gets weight off most of them. He appeared to relish every yard of the two-miles in the land down under. He is the pick of William Buick and at 13-8 is my pick as well. The danger would be stable mate Ispolini. The four-year-old was an impressive winner of the G.3 Nad Al Sheba Trophy last month and is clearly improving but this is a big step-up again. G.1 Prix du Cadran winner Call The Wind should fill the places. At 2.40 it’s the Group One 6f Golden Shaheen on the Dirt and I think this is a tricky race for punters. Breeders Cup Sprint winner Roy H was jolly but will not run due to a foot abscess. Imperial Hint was my tip for in the Breeders Cup Sprint but was beaten into third behind Roy H that day. Something was clearly amiss when he was beaten at odds-on at Tampa Bay last month and his form coming in to this would be a concern though if back to his best he would probably win. X Y Jet is considered a danger but I am not wholly convinced of his chance. Drafted has won two G.3’s out here this Carnival and has won me a few quid in the process. He would need to improve again in theory but with a big question mark about the American horse has a chance. He will surely get the strongly run race with leaders to aim at that he appears to thrive on and at 4-1 is my tentative pick. They face 1m1f for the Group One Dubai Turf at 3.20. Japanese star filly Almond Eye is here and providing she takes to the track looks a solid favourite; this is her first outing since smashing the Japan Cup track record in November. She is top-rated, gets the filly allowance and is drawn in the middle in stall seven so her chances are there for all to see. Sakae Kunieda’s four-year-old is unbeaten in five starts including top-level triumphs in the Japanese 1,000 Guineas, the Japanese Oaks and the Shuka Sho, before beating the colts in November’s Japan Cup. I backed her at 5-4 earlier this week. Talking after his stable star enjoyed a spin on the track on Wednesday morning, Sakae Kunieda said: “She loves this place. When she came to Dubai she became relaxed and her appetite is good. She enjoyed the turf track (during morning exercise). Dubai provides big races and after the Japan Cup, we decided to choose this race. In the Japan Cup she won from the front and in other races she was (further) back, so both cases are OK.” Godolphin will likely have to play second fiddle with Dream castle and Wootton whilst Without Parole should run a good race for John Gosden. We stay on the Turf for the 1m4f Group One Longines Dubai Sheema Classic at 4.00. Rey De Oro was fourth in this last year has to be considered but I put up Old Persian when he won the G.2 Dubai City Of Gold over track and trip on Super Saturday and am sticking with him. The 4yo will strip fitter for that first run in nearly 6-months and is possibly still improving. Stall two is about perfect and gets a tiny little bit of weight from the Japanese horse. I have a bit of the 13-8. Talking this week Appleby said of him “He is a Royal Ascot and Great Voltigeur winner and is a solid Group Two horse. Hopefully with that natural Dubawi progression from three to four, we will see further progress from him." The big one the Group One Dubai World Cup over 1m2f on the Dirt track is due off at 4.40. Arguably the most open of all the races on the card you can make a strong case for the first five in the betting at least! Last year Thunder Snow made all from the outside, was drawn 10 of 10, under a great ride from Christophe Soumillon who set steady fractions and kept plenty in reserve on a dirt track on which it can be difficult to make up ground. He is drawn 12 of 13 this year and as Capezzano and North America, two well-fancied front-runners, will break from stalls 2 and 3 respectively he does look up against in his attempt to retain his crown. Trainer Saeed Bin Suroor admitted he would have chosen a stall towards the middle given the chance. North America blew his chance at the start last year but jockey Richard Mullen is not expecting a similarly slow break. Talking earlier this week he said "He hasn't put a foot wrong this year, we've schooled him out of the gates at home, and I think it was just one of those things. I'm happy with the draw and the horse is in great form." The 7-year-old won rounds one and two of the Al Maktoum Challenge and might be coming to the boil at just the right time. This really is wide-open but I have a bit of the 3-1 about leading UAE trainer Satish Seemar’s stable star. I took 6-4 back in February ante-post about Blue Point and feel confident. I am a fan anyway but the five-year-old has simply looked head and shoulders above his opposition out here this winter. As of today I have added to that single bet with four more, all NRNB.